L’esprit de l’escalier: hindsight is always 20/20, and I’ve had two and a half years to come up with that. The association with Maestro Abreu, even if only titular (the second class never had an opportunity to meet with him) has been extremely valuable to me, but has never been enough on its own. The fellowship program in its first year had yet to establish a clear identity, a function mostly of its compressed start-up window, so I have always relied on my analyses and reflections of my experiences working within Venezuela and in similar organizations around the world, paired with extensive research, for the opinions I express, rather than promulgating uninformed romantic conjectures. That, plus “Abreu”, is the brand I’ve tried to build. But that beautiful title of Abreu Fellow is no more. As part of the renewal of NEC’s relationship with the FundaBol, the title has now been changed to “Sistema Fellow,” thus trading a very known and highly respected quantity for an entity that is largely (if not by definition) undefined. I don’t entirely disagree with this decision. The original name was expressly discouraged by the Maestro himself under the very reasonable rationale he could not be seen actively supporting an eponymous program. (His request was overruled by the now-departed program management.) But he did support it in his own subtle way, and he continues to support its graduates, including me, to an extent that I find extraordinarily humbling. As for the program itself, its substantive brand has emerged as “capable núcleo managers.” Although this is disavowed by NEC, there is a very clear instructional emphasis on organizational development in the American not-for-profit environment, with the time spent in Venezuela significantly reduced. The program evolution is perhaps a natural response to the most pressing challenges in the US, and NEC has found excellent faculty, so no criticism should be inferred. NEC has historically quantified and communicated the relative success of the fellowship by the placement of its graduates in middle or upper-management positions in organizations in the US – by which standard I am the most unsuccessful Fellow of all, I now realize – so this is a logical correlative to that measure. With the fourth group of fellows recently announced, there remains but one more class for which to apply. I’m often asked by prospective applicants to describe my experience within the program, but its evolution, or very public growing pains, means that I can only offer an outdated perspective. My general advice to applicants is twofold. 1) It is not an “aspirational” program: being enamoured of the concepts and wanting to be involved is insufficient. The past and current classes have established a clear commitment through a representational body of work prior to applying. 2) Be certain it’s what you want. Ensure your objectives align with the program thrust, and be aware that there is still widespread industry fear and mistrust of the idea of social action through music. Some view a commitment to Sistema as heresy in a profession of deeply embedded orthodoxy. A brand can be a dangerous thing, sometimes. Most importantly, it’s only a name. Outstanding work has been done from Adelaide to Zurich by musicians, amateur and professional, who have no such title, only a deep and abiding passion for changing the world through their craft. Not being selected for the Fellowship is no value judgment on anyone’s capacity: I admire greatly those who are trying – not just succeeding – without the advantages the title confers. 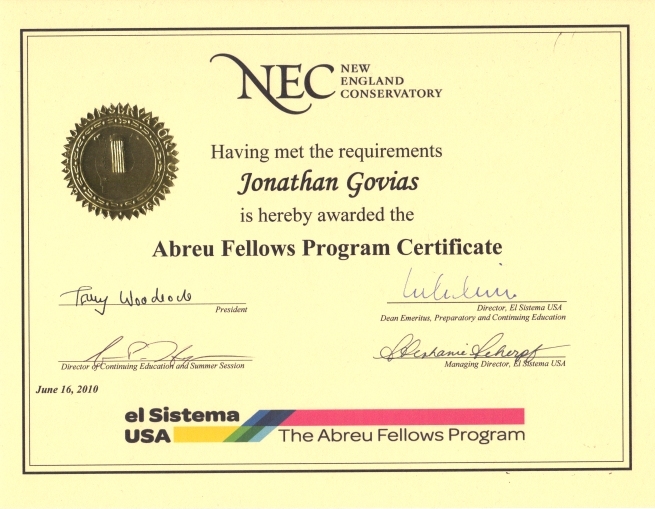 I’m proud of the achievements of my fellow Fellows, but the inevitable conclusion of the Abreu Fellows program (as I’m certain it will always be known) should mark the start of a new era, not the end. As Eric Booth put it in a long past discussion, ‘its a social conspiracy by artist’ which challenges our conventions. I get the energy to keep after it from the growing dialogue among those who engage the concept. Someone blogging recently about a Chase Grant to improve schools in an LA community in CA used the expression ‘social revitalization through the arts’. Even though this was not specifically a music program it was interesting to hear this expression. I think El Sistema is beginning to influence the greater discussion. I’m certainly not as eloquent as Eric, but my sense is that the issue is much simpler. Music as a profession (including music education – especially music education) is constantly under threat: compensation is poor and highly volatile, employment is uncertain, and job satisfaction for performers tends to be very low. Consequently, we are a fearful bunch, fearful of losing our livelihoods, and overreacting to anything perceived as a threat. Describing Sistema as socialism or a socialist conspiracy is a politically expedient way to dismiss it, with such an assessment driven in equal parts by lack of knowledge on one side, and extremist language on the other. The dumbest thing I ever said on the record, in the early days of the Fellowship, was that “the point wasn’t to denigrate or disparage the current model, but to render it obsolete.” Made for a great soundbite, but them’s fighting words. Jonathan, yes, the initial five-year commitment that NEC made will be concluding in 2014, but don’t be surprised if the Conservatory decides to continue the Sistema Fellows program. It may look a little different as we continue to refine it, but there is certainly an interest in a longer life for it.